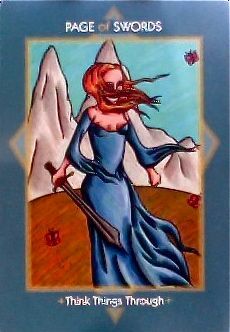 Today's Draw Classic*: Page of Swords from the Otherworld Tarot. How do you know who you can trust? What have you learned from past betrayals? And can see times where the person who ultimately betrayed you was yourself? The Page of Swords is a card that can indicate gossip or deception in someone's words. The words on the card, "Think Things Through", tells us to consider the information we're given before making a decision. To not jump to conclusions, because not everything you hear will be true. And to also be careful with your secrets, because not everyone can be trusted. Whenever I get cards like this, I start to feel paranoid. We've all been betrayed. In one case, the person I was confiding in—the last person I'd suspect—betrayed me repeatedly over the course of about two years, resulting in all sorts of issues in my life. In another case, betrayal cost the life of someone dear to me. In the first case, I didn't register anything odd in my gut. In the second case, I did, but couldn't put my finger on it. So how do we know who and when to trust? Well, of course, one thing is to honor those "odd" feelings you have about someone. If you're suspicious of someone, you may be right or you may be wrong. But honor the suspicion anyway. And another way to trust wisely is to not be so gullible. I'm a pretty smart person, but for a long stretch of my life I had a tendency to trust others' input over what I thought I knew. So if someone said 2+2=5, I might doubt my knowing that the answer is actually 4. So I suppose I would boil that down to say, "trust yourself first". Beyond that, consider what the intention of the person is who is giving you information or asking it of you. Everyone in every situation has an intention, imo. Most peoples' intentions are friendly or benign. But always consider where you think the person falls on the continuum between friendly and nefarious. Again, check your gut. And finally, and this one is key, consider your own intentions. This woman who betrayed me over a couple of years was, imo, a psychopath. She left few clues. Even looking back, I can see how brilliant she was. She never pushed too hard when trying to get me to gossip. She always seemed friendly enough. And only once did she ever lose her game face in my presence. I have no idea what I ever did to her to drive her to launch such a campaign. There was never a time I didn't like her and if I ever said anything about her, it wasn't anything anyone would consider bad. But I learned at that time of my life that truly insecure people can go ballistic over the tiniest of slights. And I have to assume that's what this was. Unless it was sheer sport. But here's the thing, the only way she was able to take advantage of me like that was because I was vulnerable. I wanted to be liked. I wanted to fit in. I wanted to "run with a certain crowd". I was weak and needy. And people like that feed on the weak and needy. So consider your own intentions, too. *Why* are you trusting someone. And if, like in my case, you know someone is betraying you, but don't know who, ask yourself who the last person you'd expect is. And even ask who the second to last person you'd expect is...haha. The person who is in your face all the time, giving you information and pretending to be your friend, may not be friendly at all. But people like that can only get to you if you let them. I wanted her friendship. I wanted to hear her gossip. I needed someone to talk to and vent to. Looking back I feel like I was pretty pathetic. But before she ever betrayed me, I betrayed myself. And I have to take responsibility for that. I used to be a lot quicker to trust. I used to dive into friendships more quickly. And I used to make myself more vulnerable to people I barely knew...I used to invest too much, too soon. Still do in certain circumstances. But with each of these pains comes a gift...a clue as to how not to let it happen in the future. So what about you? How do you know when to trust? And what have you learned along the way?